You might think that after everything I’ve already written about my remarkable Rio Grande Valley Birding Festival 2008 experience that I’d be done by now. Far from it. If you’re lucky, I’m about halfway through the tale! Bentsen-Rio Grande Valley State Park, with its anis, orioles, and fancy South Texas species, was mighty fine but did little to quench our desire to see every bird in the Rio Grande Valley! Arriving back at in Harlingen only to find Tropical Kingbirds in the trees right next to the convention center helped a little, but it was clear that as long as the light persisted, we’d need to be energetically (some might say desperately) chasing birds. Good thing a Rose-throated Becard, not the rarity it once was but still a hard ABA bird to come by, was seen lurking around Weslaco, just a short drive away! What could Bill, Jim, Sharon, and I do but wolf down lunch and hit the road? Ask those who have visited El Valle often which birding site they best prefer and you’ll hear the new World Birding Center Site at Estero Llano Grande State Park come up regularly. That broad pond teeming with sensational shorebirds, waders, and waterfowl provides an idyllic platform for photography. 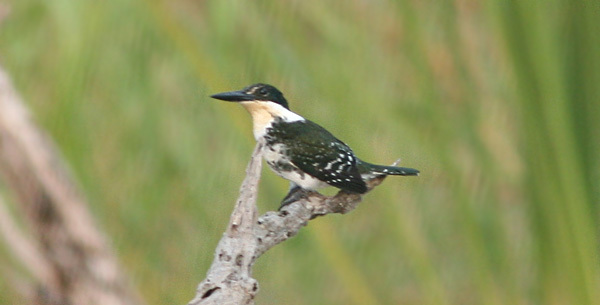 Once you pull yourself away to explore the riparian woodlands and thornscrub, you’ll find a boatload of brilliant birds. But I’m getting ahead of myself because we didn’t visit the Estero Llano Grande proper when we first arrived. Instead, we combed the area that will one day be a proper portion of Estero Llano Grande. As I understand it, the trailer park outside the World Birding Center site is part and parcel of Llano Grande land. However, some folks still have residency rights, which makes birding the messy thickets and alleys somewhat intrusive. This meant that we had to meet up with a representative to guide us through our target territory. We were also pleased to meet up with some other birders, including Hugh of Cornell’s Round Robin blog and Grant of The Birder’s Library. What we didn’t meet were any lurking Rose-throated Becards or Clay-colored Robins. I also failed to pick any Cave Swallows out of the hirundid helter skelter in the upper atmosphere. What we did find apart from a few warblers and kingbirds was a single Black-throated Magpie Jay, presumed to be an fugitive from confinement rather than a vagrant. If you’ve never had the pleasure to behold this magnificent species, a Magpie Jay is a big bird flashing a lengthy tail and prodigious crest, adorned in azure plumage set off by a white chest and that telltale black throat. It’s little wonder that this charismatic corvid is the cover model for A Guide to the Birds of Mexico and Northern Central America. For those diehards eager to hear about birds they could actually record on their ABA lists, we took our show over to the showcase lake outside the birding center. This slice of the Arroyo Colorado was bursting with Black-bellied Whistling Ducks and allegedly a Fulvous or two besides. Also present were abundant Black-necked Stilts, Long-billed Dowitchers, and both yellowlegs. We picked out plenty of egrets including the first Snowy of the trip and spied both Solitary and Spotted Sandpipers. 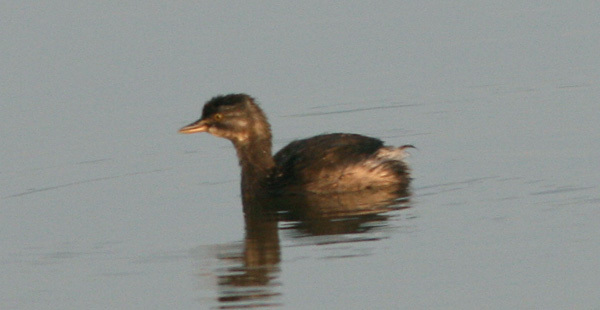 The lake was also good for grebes, with both Pied-billed and Least accounted for. The birding center was technically closed for the day but the staff was gracious enough to allow us a few more moments to enjoy a rare sighting. Of course, we were easily distracted by the chatter of a spectacular Green Kingfisher chattering away within her secluded demesne of marsh cane. The Little Blue Heron behind her was nice and all, but Green Kingfishers are deucedly hard to spot north of South Texas. 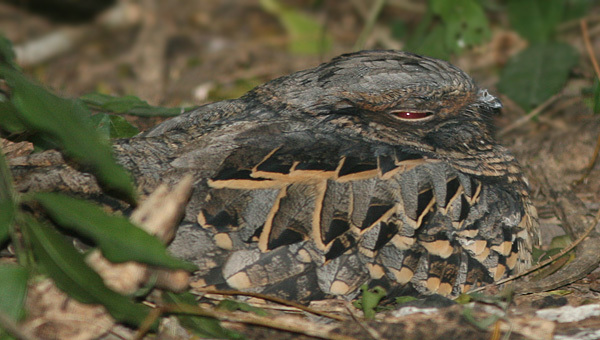 As soon as we could pull ourselves away from the kingfisher, Grant graciously shared with us one of the most unusual, most sought-after sightings a bird watcher could want: a nightjar five feet away! Yes indeed, a Common Pauraque sat stock still in good light close enough that we could pretty much snap away with impunity. Apparently this pauraque couldn’t care less about paparazzi. So it was that I ended the day with my best views ever of a caprimulgid. Truly, Estero Llano is grande! That whistling-duck shot is great! That Pauraque shot is ridiculously awesome. I love their call. I’ll do my impression next time I see you. Thanks, guys. Will, I can see how you’d be particularly partial to that nightjar! Or I can head to the South West where I can get some sympathy! That Pauraque was probably the most amazing thing I saw in a week full of amazing birds. I was, and still am, completely floored by it. Great shot of it, btw! You can even see the nostrils, which was just one more surprising thing about it. I could watch that bird for hours. I’m loving the festival coverage Mike. I’m with Corey on this one…really great BBWD shot.